Kracie is finally in the Philippines! I am one hell of an online shopper! I really am and I'm proud to announce that! I like browsing through various online stores (locally and internationally). I don't always shop online, sometimes, I just want to update myself on brands out there that I may look into when I get to visit the country of origin. One of my favorite online store Sasa (www.sasa.com) sells different brands of International and Asian Cosmetics and skincare! I've browsed through their website (particularly BRANDS) so many times I think I already memorized all the brands available in that website! That's why when I got a care package from Beautybox Corp. called Kracie, my heart immediately took a leap! Yes! It is a brand I know, I've read about it and seen them on sale on huge online stores like Sasa. If you browse through Kracie Japan website, you'll see that the company has a long history! And not only that, their brand goes as wide as offering not only toiletries and cosmetics but also Pharmaceuticals and foods! Thanks to BeautyBox Corp (the company who brought us K-Palette) brought in Kracie's bestselling products! *sigh* I admit, I have so much body products but receiving these as gifts definitely sets my heart on fluttery mode! I can never get tired on skincare with gorgeous packaging and wonderful scent! And if you are still on a gift-giving mode! You may want to look at each of these products and the price tag! Now, on to those who are on a search for good hand creams! I actually tested this first out of the 4 products I got! Happy Sweet Peach, Fantastic Bery, Fine Apple & Gardenia. This hand cream is non-greasy, smells wonderful and helps soothe dry hands! I like to use this especially at night when I'm off to dreamland! The scent is just so relaxing! I may not be into body lotions nowadays as I spend so much time with Baby AMW! My sister, on the other hand, is so into body lotions she can actually finish a tube in a month or less! I will definitely share this to her and make her happy this Christmas! What I'm most excited about is the fact that Kracie Philippines also brought in Kracie Haircare products --- Oil In Shampoo, Oil In Conditioner and Oil In Treatment (Each priced at Php695.00)---these are all in sulfate-free and silicon-free formulation which is perfect for my sensitized hair! Aside from that, there's also NATULULU lline. This line is a moisture-rich skin conditioner/lotion in a form of water! So unique huh? This line is best for users with sensitive skin because they are allergy-tested, fragrance-free, coloring-free, less acidic and Mineral Oil-free! 3 products to watch out for are --- Yuzu Citrus Extract, Rice Extract and Tomato Extract (Php495.00 each). And just when you're ooh-ing and ahh-ing thinking that's enough for the coming new year? You're wrong! There's also HADABISEI, this line is quite famous for mask users and lovers! I'm referring to the Hadabisei All-in-one facial masks, 40 sheets costs Php795.00. Give this brand a try and tell me your thoughts! So far, the hand cream is promising and I'm trying out Pure Savon next! 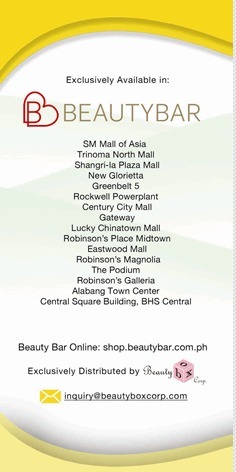 **ALL KRACIE PRODUCTS are available locally at Beauty Bars. Have you heard about Kracie before this post?